You’ll be surprised by how easy it is to make this sumptuous entrée. We recommend using our locally made fresh Union Market potato gnocchi. A mouthwatering meal comes together in no time at all, making it perfect for a weeknight family dinner or for low-maintenance entertaining. Place the olive oil, garlic, and shallots in a medium high-sided skillet over moderate heat. When the shallots begin to color, add the diced squash to the pan and season with salt and pepper. Stir infrequently, allowing the cubes of squash to caramelize lightly. After the squash is uniformly golden brown—five minutes or so—add the bay leaf, nutmeg, sage, vegetable broth, and half-and-half to the skillet. Lower the heat and continue to cook until the squash is tender—about 8 minutes. Using a fork, remove the bay leaf from the skillet. Purée the squash mixture using an immersion blender or a jar blender. If using a jar blender, allow the mixture to cool for at least five minutes before attempting to blend it—and make sure not to fill the jar to more than half its capacity. Taste the purée for seasoning and adjust as necessary. Pour the mixture back into the cleaned skillet and set aside in a warm place while you prepare the gnocchi. Bring a pot of well-salted water to a boil. Add the gnocchi to the boiling water and cook according to the instructions on the packet or until al dente. 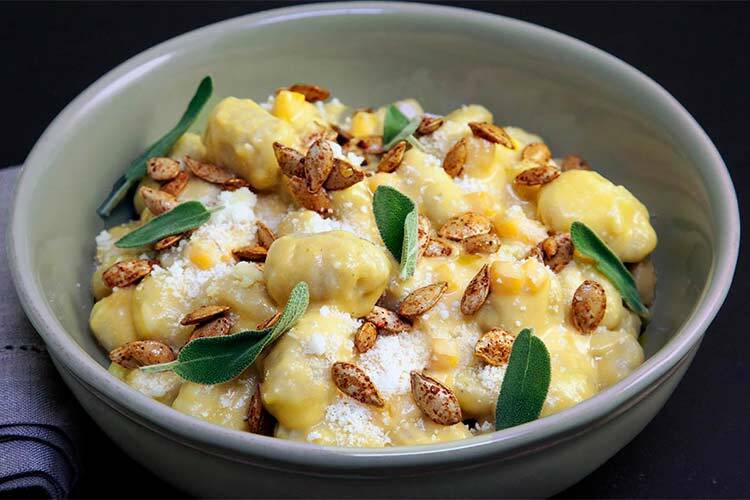 Tip the drained, cooked gnocchi into the prepared sauce along with the ½ cup of cheese and 2 tbsp of pumpkin seeds. Mix gently to incorporate all the elements of the dish. Top with a sprinkle of additional cheese and some olive oil, if desired. Garnish with fresh sage leaves and pumpkin seeds and serve immediately.